People with disabilities shall be able to enjoy travelling on equal basis with others, with access to transportation, recreational, sporting and tourism venues and activities. The map shows the distribution of attractions in Hong Kong alongside their accessibility for the disabled. 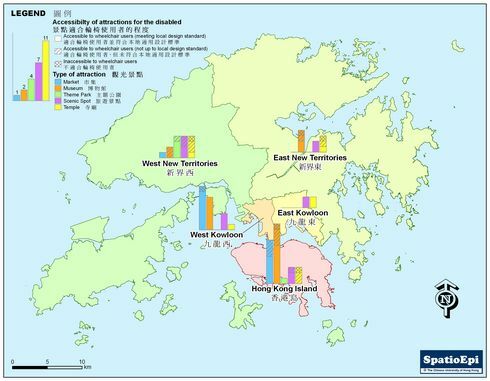 As depicted by the bar charts, attractions in Hong Kong are clustered in the urban areas in West Kowloon and on Hong Kong Island. Most of these are accessible to wheelchair users, but the accessibility of museums or temples in the New Territories is generally lower. Accessible sightseeing spots allow tourists with mobility problem to travel independently. They contribute to the recognition of Hong Kong as an accessible metropolis. 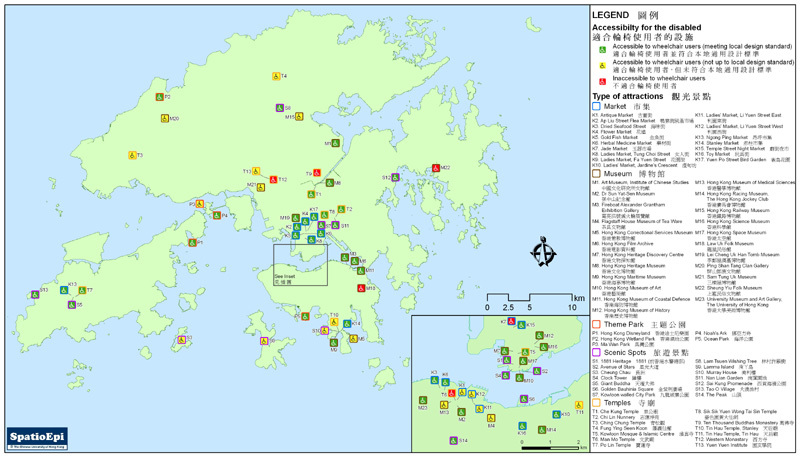 Data for the map were derived from the Visitors' Guide to Accessible Facilities in Hong Kong 2010, published by the Hong Kong Society for Rehabilitation. Convention on the Rights of Persons with Disabilities reaffirms all human rights and fundamental freedoms, which persons of all types of disability shall enjoy. These follow some general principles such as accessibility, equality of opportunity, full and effective participation and inclusion in society, non-discrimination and respect for inherent dignity, individual autonomy and independence of persons. In the Convention, Article 9 highlights the role of States Parties in ensuring persons with disabilities to have access to physical environment, transportation, information and communications and other facilities or services open to the public. The Convention came into force on 31st August in 2008 in Hong Kong Special Administrative Region after it was signed by the Chinese Government in March 2007. To enhance the accessibility of different facilities for the disabled, the Buildings Department of Hong Kong Government has also published a manual on local accessible design standard in 2008.